This post was sponsored by Cost Plus World Market. I feel delighted and privileged to be able to work with brands that I genuinely love and that help me to keep this site up and running! Thank you so much for continuing to support my passions and efforts by being here! As always, all opinions are my own! My Aunt Corrie makes the most beautiful poached pears. Deep ruby in color and scented with spice, they resemble fine jewels more than fruit. Very delicious fine jewels. Poached pears are undeniably show-stopping and make the perfect dessert for company. This winter, I set out to develop a version that would be as simple to make as it was impressive. The slow cooker is the perfect choice of cookware for poaching because the longer these pears steep in their wine bath, the more flavorful they become. Of course, if you do not own a slow cooker, you could easily substitute a dutch oven set over low heat. Though you could make these pears any day of the week, I love using this recipe as a "company dessert" because it is so hands-off. While you are enjoying your guests, dessert is taking care of itself. When it came to devising my poaching liquid, Cost Plus World Market came to my assistance with their amazing wine and pantry sections. This recipe begins with a bottle of rich and fruity Ménage À Trois Cabernet that is sweetened with raw sugar and scented with orange zest, vanilla bean, and a duo of warm, wintry spices. The combination is just sweet enough and layered with flavor. While the mixture heats in the slow cooker, the pears are prepared. When shopping for your pears, try to find ripe, firm specimens that have their stems intact. This will make turning and serving them a bit easier. By this time, the wine should be simmering and you will never again want to leave your kitchen because it just smells sooo good. The pears are flipped halfway through the cooking time, and are simmered just long enough for them to take in all the wonderful flavors of our spicy wine, but not so long that they become mushy. You are still looking for them to be slightly firm and spoonable. This color! It makes my eyes so happy. Is it too early to start planning for Valentine's Day? I feel like these would be a pretty stellar choice. After the pears have cooked through, some of the cooking liquid is removed from the pot and boiled down to a thin syrup that will blanket a couple scoops of vanilla ice cream. 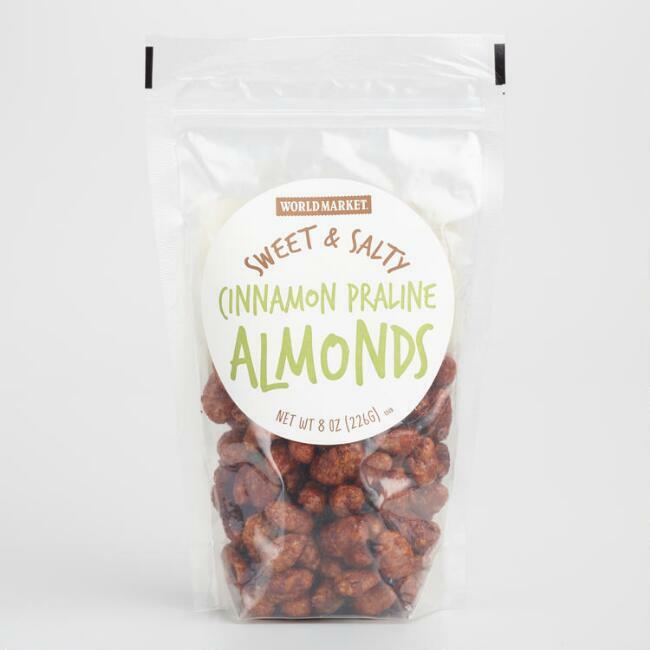 Sweety and salty cinnamon prailine almonds bring a very welcome bit of crunch to the scene. And just like that, dessert is served. Here's to slow, winter days and the sweet rewards that they bring. I found all of these items at my local Cost Plus World Market in Williamsburg, Virginia. You can find all of these items and more at your local store ! Use a vegetable peeler to remove two, 5-inch strips of zest from the orange. Combine wine, sugar, cinnamon sticks, vanilla bean paste, whole vanilla bean, allspice, cinnamon and orange zest in your slow-cooker and set on high heat. Heat, stirring often, until the sugar has fully dissolved and the mixture is steaming; about 45 minutes. Add the pears to the mixture and cook on high for 2 1/2 hours, flipping the pears halfway through. The pears should be deep burgundy in color and fork tender, but not mushy. Turn the heat to low and remove 2 cups of the liquid from the slow-cooker and transfer to a small saucepan. Bring the liquid to a heavy simmer over medium high heat, then reduce heat and simmer for 10 minutes; until the syrup has reduced by half. Serve the pears alongside vanilla ice cream and drizzle with the reduced syrup. Sprinkle with chopped almonds just before serving. Enjoy!